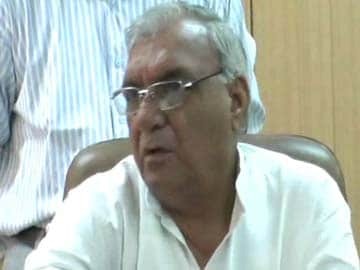 Chandigarh: Haryana Governor Kaptan Singh Solanki has sought a reply from the Bhupinder Singh Hooda government over the controversial appointment of five senior officers which allegedly violated protocol. The Governor has given the government 15 days to reply. The Governor's move follows a memorandum submitted to him by the opposition BJP, seeking his intervention in the matter following an objection raised by senior bureaucrat Pradeep Kasni. Mr Solanki had just taken charge on Sunday as the new Governor of the state when Mr Hooda swore in five important officers to serve on the Right to Information and Right to Service Commissions which are meant to empower citizens by helping them access information about government decisions. The Chief Minister claims that he was authorised by outgoing governor Jagannath Pahadia to appoint the commissioners. But the BJP says the new governor's permission should have been sought. Mr Kasni has been supported by another bureaucrat, Ashok Khemka, who challenged Mr Hooda and his government for allegedly bestowing sweetheart land deals in Haryana to Robert Vadra, the son-in-law of Congress president Sonia Gandhi, charges denied by Mr Hooda and his party. Mr Khemka tweeted on Thursday, "Lure for post-retirement sinecures harming institutions."